If reducing your energy costs is one of your goals to minimize your expenditure, getting a solar water heater should be included in that plan. The power crisis and electricity price hikes in Africa is quite alarming. As a result, there are numerous interventions offered by various institutions like the African Development Bank to reduce electricity consumption. Of all these interventions, solar water heating is the only method that is 100% independent of electricity; meaning that once the initial purchase price has been paid, the water heating bill will be non-existent. The actual savings will depend greatly on your use of hot water, but according to Energy saver; on average, if one installs a solar water heater, the water heating bills should drop by 50%–80% monthly. Also, because the sun is free, one is protected from future fuel shortages and price hikes; and especially as the electricity price is set to increase over the coming years. Once the system is paid off and there is a rebate offered as well, the solar water heater provides a key link in the overall energy saving strategy for your home or business. So, if reducing energy costs is one of the goals in order to minimize expenditure, getting a solar water heater should be included in the plan. A 50-collector solar hot water system can offset over 50 tons of CO2 per year, or 5,000 tons over the life of the system. A 100-collector pool-heating system can offset over 80 tons of CO2 per year. This means that there will be a carbon dioxide emission reduction of 95 tons every year when solar water heating is used. In that case, rather than burning fossil fuels such as natural gas or fuel oil to heat water, there should be a serious consideration of tapping into the free, limitless energy of the sun to heat water for your commercial or residential building. Solar water heating systems are increasing in popularity mainly with major construction projects such as new apartment buildings, hotels etc. ; consequently increasing the number of distribution channels as well as selling agents as the market growth continues in Africa. The upsurge can be attributed to various government regulations that have been put in place in order to ensure that Africa remains on track with regards to going green and saving on energy costs. In 2009 it was found that Kenya had a potential market for 100,000 SWH among small consumers alone. In 2008, between 8,000 and 10,000 m2 were installed. Not only this, but there was also a large market potential within the hotel industry with an addition installation potential of 6000 SWH. This SWH progress was partially due to the increasing electricity prices and to Government support which is spurred but the fact that SWH can help reduce peak load. In that regard, the Electricity Regulatory Commission (ERC) directed that homes and buildings that are likely to consume more than 100 litres of water must fit solar panels. The directive that came into force in May 2012, now known as the Energy (Solar Water Heating) Regulations 2012, was directed to fittings in residences, hotels and guest houses that have hot water facilities. Buildings that existed before the directive came into force were given five years to comply. The ERC warned developers and contractors that they must comply with the energy regulations, or risk the penalties. Moreover, today imported solar thermal panels pay no customs import duty tax in Kenya. The regulations were aimed at cutting down the use of non-renewable energy and ease the current destruction of the environmental and energy burden of the country. 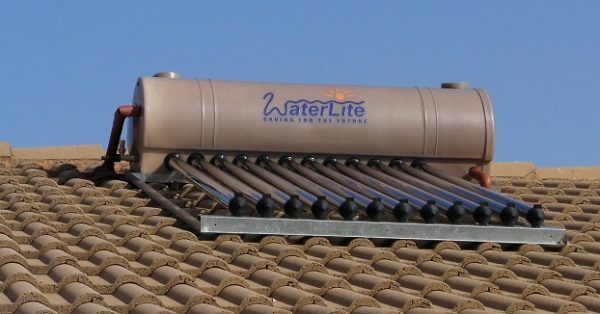 In 2008, the South African government via the country’s electricity public utility ESKOM initiated a subsidy programme called the Solar Water Heater Rebate Programme. This was done in order to mitigate energy system constraints by installing a million solar geysers in homes across the country by 2013 and actively encourage and promote the widespread implementation of solar water heating. To fund the programme, the National Energy Regulator of South Africa (NERSA) allocated funds, to cover programme development, marketing and funding the incentives to consumers to pay rebates for five years, after when the programme would be reviewed. However, the programme only managed to roll out about 424,790 solar geysers by 2015 after ESKOM withdrew from the programme early that year to allegedly focus on its main business which is the supply electricity. “Some 10 years ago there was about a dozen manufactures of domestic SWH’s in South Africa. When the South African government via ESKOM commenced with the subsidy program the products available on the SA market swelled to 500 suppliers of mainly products imported from the East. Today the bulk of these ‘get rich quick’ suppliers have disappeared with end-users having systems without spares or service. Some South African manufacturers also fell by the way side,” says Mr. Trevor van der Vyver of Maxlite South Africa. The domestic African Solar Water Heating market has seen substantial albeit erratic growth since the 20th century. Eng. Arvinder Singh of Steelstone Kenya Limited, one of the leading supplier and installer of solar water heating systems in Eastern Africa insists that; the solar water heating market can be considered as growing despite having a presence in various African countries over a significant period. “There are many factors contributing to this growth which include: Increase in the cost of electricity which is predominantly used to heat water in households has turned consumers to alternative sources such as solar; changes in rules and regulations set by the respective authorities has resulted in an increased interest in solar water heating systems further materializing into the increased demand of the water heating systems,” he adds. 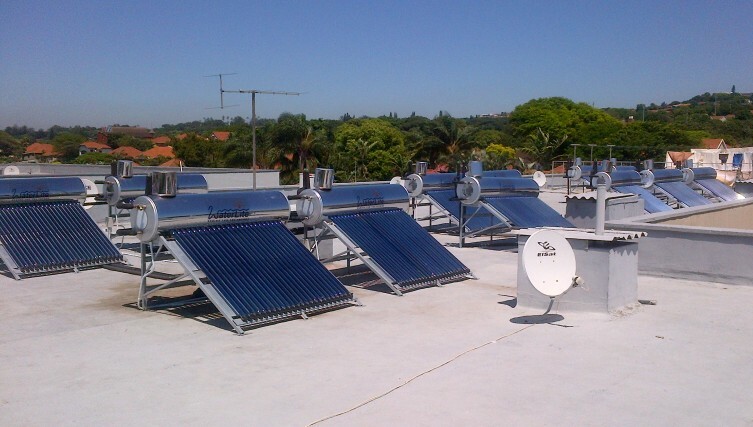 In South Africa, standards exists for complete solar water heaters and standard electrical geysers. SANS 1307 caters for the complete solar geyser, tank, collector and temperature control gear; and SANS 151 is for a standard electrical geyser. Mr. van der Vyver explains that, over the years many companies have manufactured solar water heaters in Southern Africa. Some more effective and durable than others. The numbers of SWH companies have dwindled mainly due to affordability by the end-user. Coupled to the price hurdle of S.W.H.’s, domestic heat pumps are now imported into the already stretched market. Being a relatively new venture in the African market, solar water heaters have had their own share of challenges in the African market. According to Eng. Singh, despite the increase in the number of distributors and agents, the lack of expertise has often resulted in the systems to work inefficiently resulting in an increased cost or at times a whole replacement of the system by another company. “The bearer of the cost is the owner of the system. Moreover, despite having increased imports of Solar water heating systems, due to a lack of standards and regulations of systems often poor quality systems are imported and installed which leads to the issues mentioned in the previous point. Furthermore this has resulted in a lack of consumer confidence in purchasing the panels due to poor experience,” he affirms. He further adds that, more support from the national government to the local manufacturing industry is very important if growth projections are to be met. “The Kenyan government should support the local solar panel manufacturing industry through incentives such as tax cuts or rebates. This will allow the manufactures to compete with the cheap imports; furthermore it will create local jobs and the potential for increased investment both foreign and local which could potentially have a positive effect on the GDP of the country,” he asserts. Mr. van der Vyver further mentions that, as the ESKOM project came to an end in South Africa, many suppliers disappeared leaving users with equipment without spares for repair. Today, the South African market has less than a handful of tank manufacturers and even less manufacturing SWH. In order for the Solar Water Heater to have a longer life span and at the same time provide the best service possible, the installation and maintenance must be top notch. According to Mr. Khalid Al Zubaidi of EMZ in Dubai, with any type of solar water heating system, proper installation and maintenance is critical and should only be done by a qualified, experienced supplier/contractor. When selecting a supplier/contractor, look for one with a good deal of experience installing and maintaining that specific type of system. Check with your state or county for licensing requirements, check references from past customers, and check sources like the Better Business Bureau for any complaints or problems,” advises Mr. Al Zubaidi. “The Solar Water Heaters market is driven by a combination of factors, such as a growing building and construction industry, the power crisis and electrical price hikes, changing lifestyle and technological developments. The growth of the market in Africa is mainly attributed to increasing consumer preference for sophisticated and advanced products, supported by increasing disposable income, growing construction industry, increasing retail infrastructure, and others. Increasing demand for the continuous flow of hot water in households and commercial establishments is expected to drive market growth in the coming years,” asserts Mr. Al Zubaidi.